It would be fair to say, that breeders and admirers of Manx cats have generally fallen into the 'minority' camp when compared to other feline breed and show groups. But these sweet and plucky cats have, and will always, appeal to those cat fanciers looking for something uniquely different, or difficult to come by, and with some rare or novel trait. They are usually summarily dismissed, by those cat fanciers who consider that the tail of a cat is an essential feature, one which appeals to their sense of beauty. The Manx fancier, on the other hand, will be smitten by what looks like their foreshortened appearance, their high, rounded rump, and taillessness or stump. Tailed Manx are greatly valued by various Manx breeders and fanciers, as they have the wonderful character and other attributes of the Manx cat, as well as being essential for breeding purposes to maintain the viability and health of this unique breed. Breeders specialising in Manx at that time included the Woodiwiss brothers, Miss Samuels, Mr. Jungbluth, Mr. & Mrs. H.C. Brooke and Mr. Gambier Bolton. Others to share in this interest were Lady Alexander, Miss Jay (better known for her Blue Persians), Mrs. Moseley, and Miss Hester Cochran, the latter who eventually gave up all other breeds to specialise only in Manx, and who in due course became the Honorary Secretary of the Manx Cat Club when it was duly formed in 1901. Although 'King Kangaroo' does not seem to appear in any publicly listed register, that he was in fact registered is not in doubt. 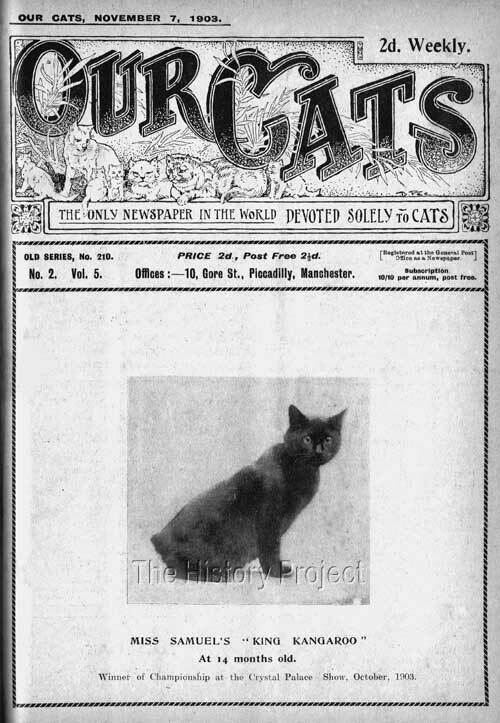 His details for this article have been drawn from his appearance in articles published in Our Cats from both 1903 and 1904, plus his entry into the Show Catalogue of the Midlands County Cat Club, in 1906. Sad to say, that in the case of Manx cats, very poor efforts were made to record even the most basic information and very often, even when they were registered, important basic details such as their colour or pattern or even their gender, or date of birth, were very often omitted! Certainly some of the earliest cats were of unknown parentage, which can be understood given their acquisition from the Isle of Man, or bred from cats imported from there. Nevertheless it is rare to find full details for more than just a few. Full siblings: Sired by 'Philip I' and out of 'Teenee Tinee'. 'MOFF-TOFF', Black Manx female, born 16th May, 1899. Bred and owned by Miss E. Samuels. Bred by Miss E. Samuels. Owners: (1) Mrs Higgins,(2) Miss A.K. Clifton, (3) Hester Cochran. 'BEELZEBUB', Black Manx male, born 27th June, 1900. 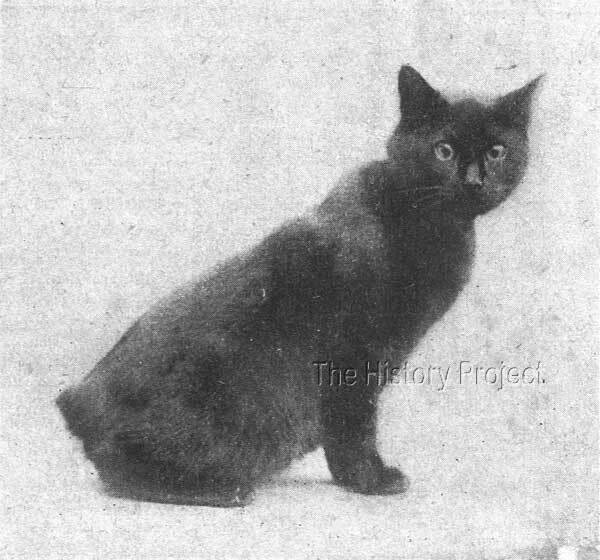 'LUCIFER II', Black Manx Female, born 4th July, 1900. 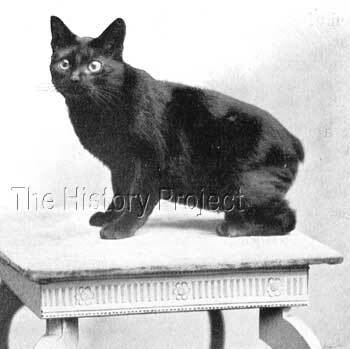 'LUCIFER III', Black Manx female, born 4th July, 1900. 'BOYGUM', Black Manx male, born 19th February, 1904. Sired by 'Philip I' and out of 'Manx Midnight'. 'MANX GIRLIE', Black Manx female, born 19th February, 1904. 'DONALD DUMPKINS', Black Manx male, born 25th June, 1904. An excerpt from a letter written by Miss Samuels to the Editor of 'Our Cats' and published in 1st October edition 1904, gives us a clear insight as to why we can find no progeny of 'King Kangaroo' of record. It also has assisted us to confirm his date of birth and his sire. 'King Kangaroo' featured on the cover of 'Our Cats' after winning the Championship at the Crystal Palace Show, October, 1903. Although 'King Kangaroo' was lucky enough to be mentioned in the chapter on Manx in Frances Simpson epic work The Book of The Cat, his image was not included. That is probably because his best wins and his new photograph were not available until a few months after the release of that publication. So apart from those few words, he has almost been lost to us, were it not for his appearance, above, on the cover of Our Cats. 'King Kangaroo's successes followed on from those of 'Golfsticks'. Nothing is more noticeable or desirable than consistency of breeding to type, health and character. Miss Samuels had begun to set new standards for others to follow.